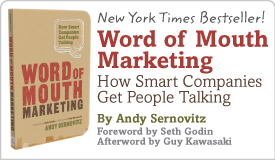 How to waste a viral lead-generation opportunity | Andy Sernovitz | Damn, I Wish I'd Thought of That! I wanted to share a video with you. It is from an industry conference where I spoke on a panel. It was really interesting, there was amazing data shared, and it would have looked great on this blog. The video is shared on the company’s website, so I assume that 1) it’s public, 2) they want people to watch it, and 3) they shared it to attract new customers. But … they turned off the bit where I can embed the video in my blog. And a blog post describing a video is pretty boring. So I did what most bloggers would do — I skipped it and moved on to write the next post.